After numbing you up for a root canal procedure, the first step the dentist takes is to isolate around the tooth to be treated. To do this we use a thin sheet of rubber called a “rubber dam” with a hole punched through it for the tooth to go through. This is placed over the mouth so that only the tooth to be treated sticks through and a metal clamp positions over the tooth and dam to hold everything in place. Using a rubber dam prevents bacteria in the saliva from contaminating the root canal procedure. It also allows the tooth to be drilled, washed and dried without the medications that we use to clean the tooth from touching any other part of the mouth. Once this is done we then go on to drill an access cavity to reach the pulp chamber and root canals of the tooth. Sometimes this can be a difficult task if the tooth has pulp stones or is calcified which means the canals have had extra layers of tooth built around it for protection against infection or inflammation over time. 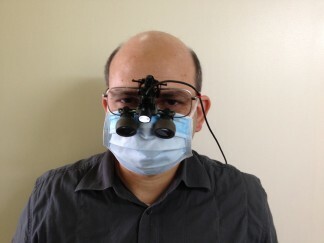 We usually use magnifying loupes to help us find the canals especially if they are calcified. Most front teeth only have single canals whereas most back teeth, particularly the molar teeth, often have 3 or 4 canals. The goal of root canal is to remove as much bacteria as possible from the root canal system of the tooth. Because root canal systems can be very complex, we can’t always access 100% of the canals every time, but we can remove enough bacteria from the canal to achieve excellent results. We use a combination of antibacterial solutions to achieve chemical penetration of root canal systems, and the use of files to physically remove the nerve tissues and bacteria inside. Hand files are typically stainless steel and look like tapered straight pins. They have rough surfaces to help remove tooth tissue efficiently and come in different sized diameters for a custom fit to the size of your canals. The most commonly used hand files are called “K files”. Each different sized file is recognized by the different colour of its file handle or head of the pin. We carefully measure the length of each canal worked on for ideal cleaning and also shaping of the canals, to ensure we attain an ideal root canal shape to be filled later on. They are used by hand in an up and down motion with a twisting action to clean the canals. Newer file systems called rotary systems attach the file to a motor to clean the canals as opposed to manual hand action. 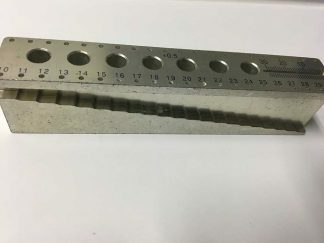 These files are usually made of nickel-titanium which makes them more flexible compared to hand files. 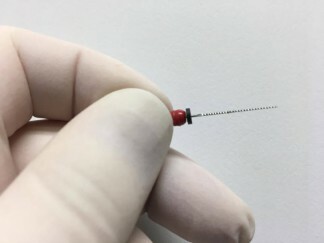 While they save time in the procedure, hand filing is still used in certain cases and is always used before rotary files can be used to ensure effective enlargement of the canal space for cleaning. Between rotary appointments, the cavity is sealed with a temporary filling and we advise patients to avoid biting on anything hard while the tooth is undergoing root canal therapy. Once cleaning is complete – and this can be over several appointments for teeth with multiple canals or canals that are calcified – we do a final rinse, dry and place sealing material which is similar to a filling for the root canals. This sealing material is called gutta percha and a size is selected to match the size, shape and length of the canal space created during cleaning. We usually take x-rays to confirm the fit. 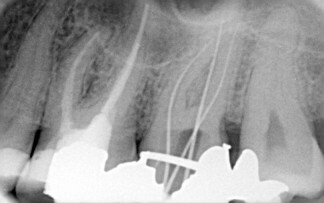 The gutta percha is cemented into the canal space with sealer. 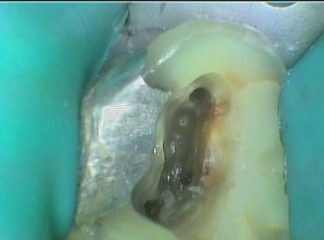 This is followed by filling up of the remaining cavity with a routine filling. It is common to also replace any existing fillings on the same tooth to ensure a good seal against new bacteria entry. The final restoration option for root treated teeth often involves placing a crown to reduce the risk of the tooth fracturing in the future. Sometimes however a crown may not be placed, for example if there is not enough height between the filling margin and the tooth bone level and alternative or additional treatment options may be discussed with your dentist.